Most people have, at some point wanted to pitch their own tent on the internet to share their knowledge or to entertain people. With over 600 million blogs published today you might be surprised to find out that women make up the largest percentage of full-time bloggers. Mommy Blogs are insanely popular. Many women take up a blog once they have a baby. Many others maintain health or fitness blogs. In fact, there’s no shortage of blog topics. You can easily find rather obscure blogs about squirrel nutrition or how to powerwash a driveway. Michelle Schroeder-Gardner started her popular finance blog “Making Sense of Cents” while working as a financial analyst. Once it gained a following she left her full-time gig and now travels around the world while posting updates to her blog. Gardner also shares her blog’s income numbers every month and posted recently that “Making Sense of Cents” earned her $241,649 in March. One month and nearly a quarter of a million dollars! Her story is not the norm. I sat down and spoke with Pamela Wilson who coaches bloggers and entrepreneurs through her company BigBrandSystem. 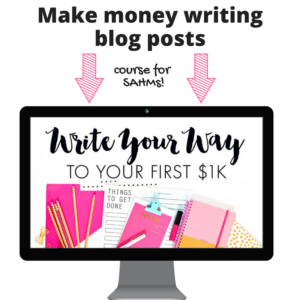 She says blogging to earn a primary income is not easy so you better love what you’re doing. Wilson says when you’re thinking of the focus of your blog to be very specific. If you make the focus too wide you won’t get as many passionate readers as you would if you were blogging about a small niche. Wilson also urges new bloggers to personalize the content by sharing stories and examples from their own lives and the lives of people they know. She also said every blogger should realize the time commitment it takes to blog consistently. Blogging isn’t too technical to get started and there are dozens of options on where to blog, how to find a name and website address and how to go about monetizing your new blog. I am posting a series of blogs on blogging here.